The Bardex I.C. Silver-Coated Latex Foley Catheter is clinically proven to reduce catheter-associated urinary tract infections. Incorporating a technologically-advanced formulation consisting of Bacti-Guard silver alloy coating and Bard hydrogel, the Bardex I.C. Foley catheter dramatically reduces bacterial adherence and minimizes biofilm formation. The occurrence of urinary tract infection is 3.7 times greater in patients catheterized with a standard catheter than in patients catheterized with the Bardex I.C. 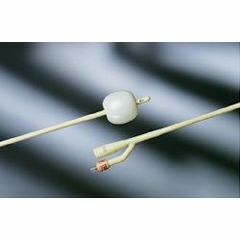 Foley catheter with Bacti-Guard silver alloy coating and Bard hydrogel. No infections so was good! No infections so that was good! Quick service. And we got everything we asked for. Product was great. The only negative was the box it was delivered in was huge, way to large for what we ordered! My son has been using a F16 in dwelling Bardex silver coated catheters for some years. We were advised to use the F18 - is this avalable in the female length? He wears shorts during the summers and the male length is far too long. Is a silver coated catheter less likely to cause irritation in the bladder ? Yes. It has the hydrogel coating as well as the silver alloy. The hydrogel helps prevent urethral trauma. If I bought a 20fr 30cc in error, but usually bought 20fr 5cc, can I only inflate the balloon to 5cc and be OK? I've always used 30cc balloons but only inflate to 10cc. And a few times only inflated to 5cc. Never had a prob. No. 30cc balloons will slip out if only inflated with 5 - 10 cc sterile water. No. The 30 cc balloon must be inflated with 25-30cc sterile water. Anything less might result in accidental extraction resulting in injury. Are there silver-coated straight catheters? Are these catheters any easier to insert than regular non-coated catheters? Been using silver coated caths since Jan 2013 and have not experienced a single UTI. I had numerous UTI's before. I've been using them for over 2 years because of UTIs. These along with using D-Mannose have significantly reduced my UTIs. How often is it recommended to change a silver lined Foley catheter? I change mine every 4 weeks. What is meant by 16 fr? 20 fr? and so on.. is that the length of the catheter? 16 and 20 french are the diameter of the catheter. In long term use, the urethra will gradually enlarge over time, requiring a higher french catheter Catheters need to be longer for men, but women can use male catheters. 5cc and 10cc are the capacity of the balloons that prevent the catheter from coming out. fr means how big around the catheter is. The larger the number the bigger the Diameter. I believe it is the diameter of the catheter. FR stands for French, the standard measure of the catheter. The larger number, e.g. 24fr versus 16fr would indicate a larger opening inside for urine to flow through. That is the diameter around. My husband has a suprapubic catheter and his urologist recommends that he uses a 24F. 16 fr, 20 fr and so on refers to the size of the diameter of the catheter. The greater the number the larger the diameter of the pathway and consequently the diameter of the catheter. It is referring to the diameter of the tube. The larger the number, the narrower the catheter. This will determine the rate of flow & ease of insertion. Fr. (French) refers to the diameter of the catheter, the bigger the number, the larger the size. Length is pretty standard. A supra pubic cath will be larger than a urethral cath to avoid leakage.